In July 2013, the Centre for Cultural Materials Conservation (GCCMC) hosted Art Workers from ANKAAA, who visited as part of their Art Workers Extension Program. The program is an intensive, nine-month professional development program for eight high achieving and long-serving Indigenous arts workers from the ANKAAA membership. The group includes arts workers from each of ANKAAA's four regions; Arnhem Land, Darwin/Katherine, the Kimberley and the Tiwi Islands and is designed to increase art worker professional skills and industry networks. 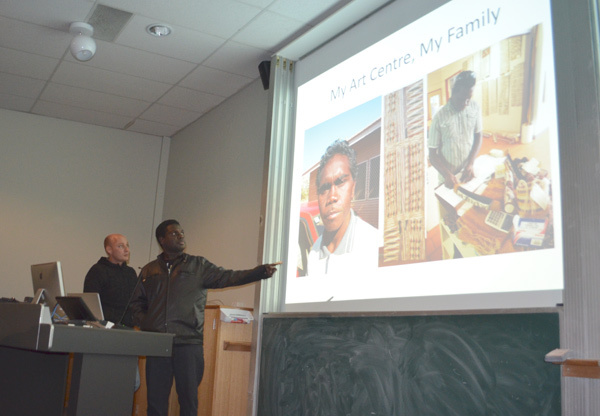 We were joined by Stanley Taylor of Mowanjum Arts, Derby; Betty Bundumurra of Kira Kiro Art Centre, Kalumburu; Edward Yunupingu of Munupi Art Pirlangimpi, Tiwi Islands; John Pilakui of Jilamara, Milikapiti, Tiwi Islands ; Barayuwa Munungur of Mulka, Yirrkala; Marcus Pascoe from Maningrida Arts, Maningrida; Evangeline Wilson from Djilpin Arts, Beswick; and Sharon Nampijimpa Anderson of Warnayaka, Lajamanu. They were accompanied by graduate mentors Jennifer Dickens and Vivan Douglas Kerinauia Warlapinni. The Graduate Program aims to build strong, supportive professional networks between Indigenous arts workers across the Top End and between program graduates and leading arts institutions, helping to create professional pathways for graduates through a range of networking and knowledge sharing activities. The Graduate Program also develops graduates’ skills as mentors and role models through a mentoring program for new Arts Worker Extension Program participants. 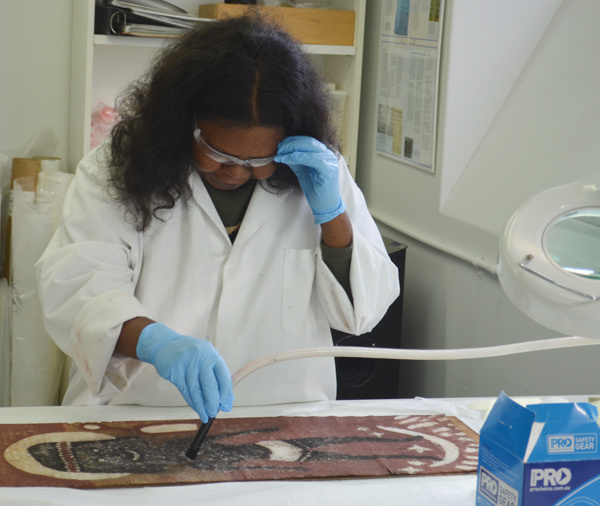 The four-day visit to Melbourne included a "Behind the Scenes" tour of the First Peoples exhibition as part of the new design of Museum Victoria's Bunjilaka – Aboriginal Cultural Centre; visits to National Gallery of Victoria and Centre for Cultural Materials Conservation: Conservation Services to view conservation laboratories, collection storage and exhibition preparation; and hands-on training in preventive conservation, remedial conservation, packing, handling and transportation with CCMC staff. This is the second year GCCMC have been involved in this program in partnership with ANKAAA. This program is vital to building lasting 2-way relationships with art centres and art workers for the long-term preservation of Indigenous cultural material. 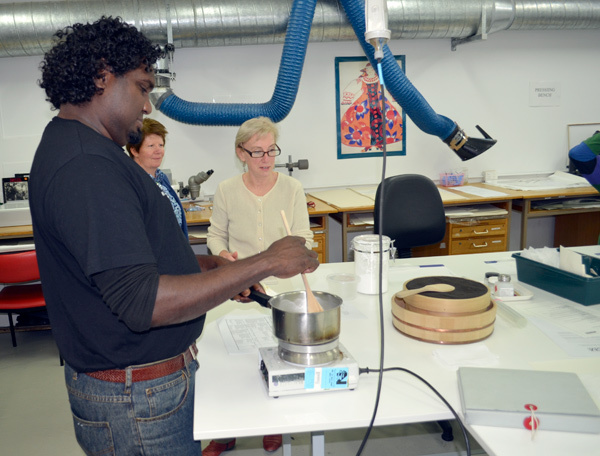 In March 2012, Art Workers from ANKAAA (Association of Northern, Kimberley and Arnhem Aboriginal Artists) visited the Grimwade Centre for Cultural Materials Conservation (GCCMC) as part of their Art Workers Extension Program. The program is an intensive nine month professional development program for eight high achieving, long serving Indigenous arts workers from the ANKAAA membership. The group includes arts workers from each of ANKAAA's four regions; Arnhem Land, Darwin/Katherine, the Kimberley and the Tiwi Islands. It is designed to increase arts worker professional skills and industry networks. 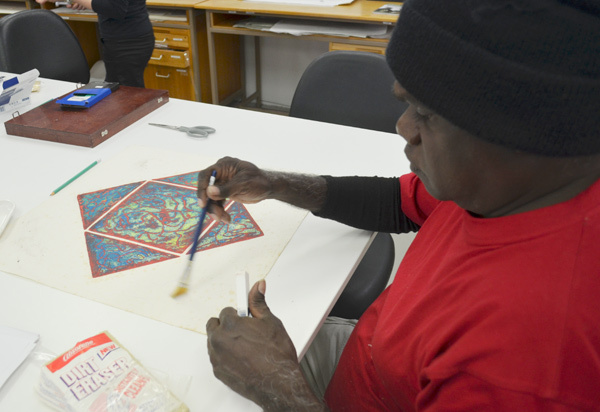 The program includes Darwin-based training sessions, work-place support, fieldtrips, cross-regional exchanges, short-term industry placements (National Gallery of Australia Canberra, Museum of Contemporary Art Sydney, Art of Gallery of New South Wales and GCCMC) and nine moth mentorships to strengthen each participant’s capacity to achieve their goals within the Indigenous arts sector. We were joined by Yimunthu Max Gumana from Buku-Larrnggay Mulka Art Centre, Alan Joshua Junior from Ngukurr, Roseleen Park from Warmun Art Centre and KevinYarrangku Winungui from Maningrida Arts and Culture. They were accompanied by mentor Rachel Umbagai of Mowanjum Artists and staff from ANKAAA Christine Davidson, Chris Darkin and Jonathon Saunders. The five day visit to Melbourne included “Behind the Scenes” tours of Museum Victoria, National Gallery of Victoria, Koorie Heritage Trust and the University's Ian Potter Museum of Art to view conservation laboratories, collection storage and exhibition preparation; hands-on training in preventive conservation, remedial conservation, packing, handling and transportation with GCCMC staff and cultural events such as Dreamtime at the G.
The program provided an opportunity to discuss traditional practices and to teach GCCMC conservators about Aboriginal cultural material and increase our understanding and ability to recommend the best approaches to the conservation of Indigenous cultural material. This important partnerships also supports the ANKAAA membership to develop conservation skills so they can look after their own art and cultural material.